Are You Facing These Major Fleet Challenges? If you want to ease bottom line pressure and gain the competitive edge you need to be successful, it's best to address your challenges head-on. 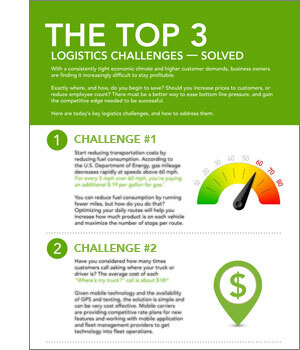 In this infographic, you'll learn the top three challenges fleets are facing today. You'll also discover how to address these challenges so you can increase profitability and improve satisfaction. If you would like to speak with one of our experienced representatives, call (800) 348-7227 or email info@omnitracs.com. © Omnitracs, LLC. All rights reserved.